Cocoa & Lavender. From the name of the blog, you can pretty much surmise that I like cocoa and lavender. Sometimes they go together in a recipe but mostly they merely live side-by-side in the cupboard. Over these past seven years, I have posted quite a few dishes that use lavender - both sweet and savory. It has been a while since I shared one with you. That realization came to me as the scent of a lemon-lavender-buttermilk-cornmeal-olive oil cake was wafting through the house. 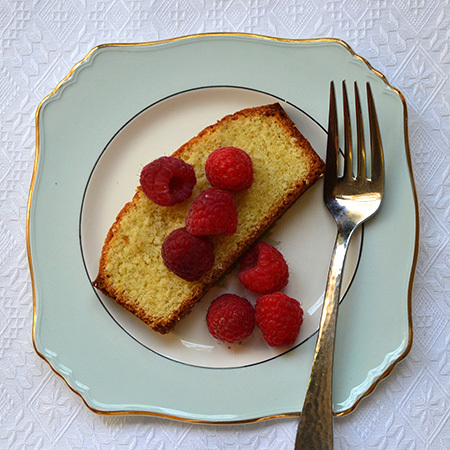 The recipe for this cake is from my friend Nicole of Riegl Palate. Nicole and I met through my brother Brad and his wife Sue. They all live near one another in Southeastern Pennsylvania. While her blog covers all components of a meal, she specializes in cocktails, appetizers, and gluten-free recipes. Today's cake is one that can be made gluten free. 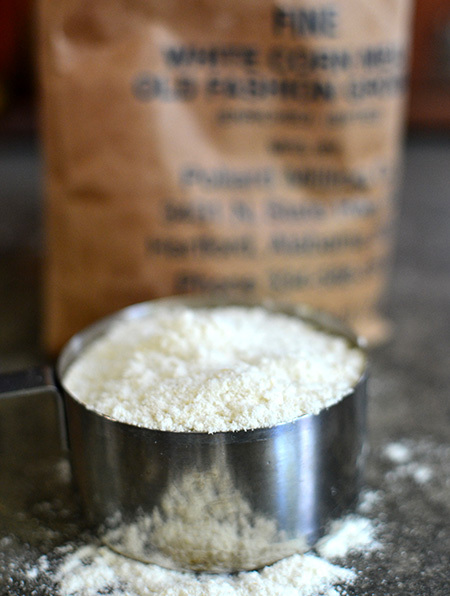 I, however, have no need to avoid gluten, so my version has good ol’ all purpose flour. The original recipe calls for fresh lavender buds and leaves, and that is hard for those of us in the desert; I use dried culinary lavender buds. In an effort to improve our eating habits these days, we are trying to eat fresh fruit for dessert. But wouldn't fresh fruit be just a little nicer with a slice of cake? Preheat oven to 350˚F. Grease a 9-inch by 5-inch loaf pan with olive or canola oil. 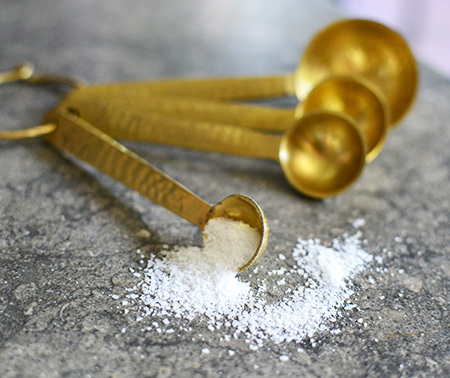 In a small bowl, whisk together flour, cornmeal, salt, baking powder, and lemon zest. 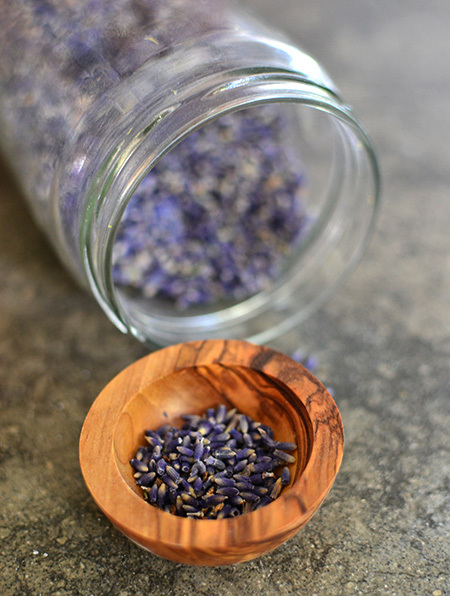 Place lavender buds and 1 tablespoon of the flour mixture in a spice grinder and pulverize. Whisk lavender mixture into the flour mixture. 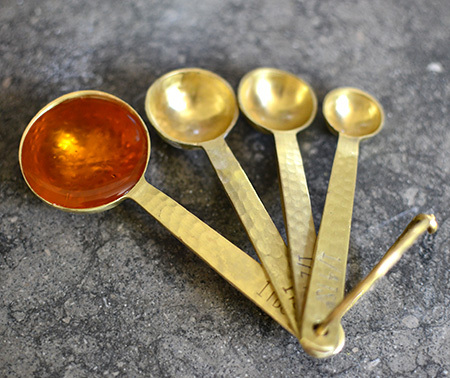 Combine oil, buttermilk, and honey in a 2-cup measuring cup. Stir with a fork to mix, but don't worry if it separates. 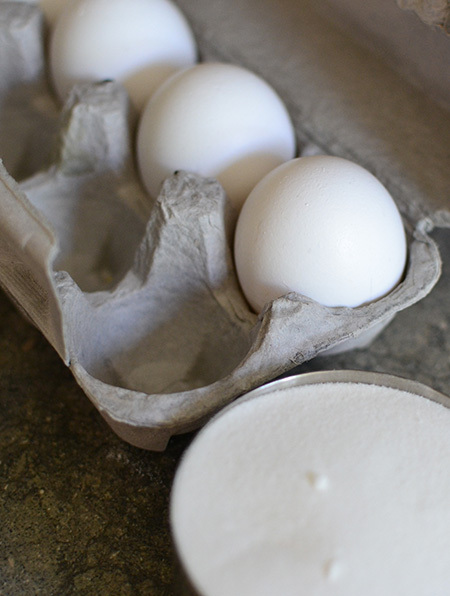 Using a stand mixer, cream sugar and eggs on medium high until pale yellow, about 1 minute. 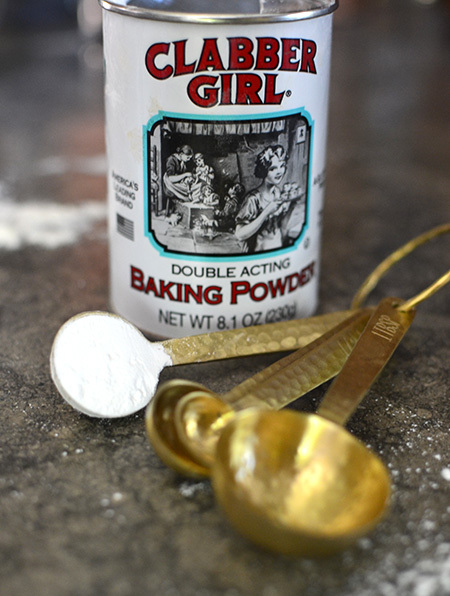 On medium-low speed, add dry ingredients in three parts, alternating with wet ingredients. With every addition, make sure to incorporate without over-beating. Scrape down sides as necessary. Using a rubber spatula, scrape batter into oiled loaf pan. 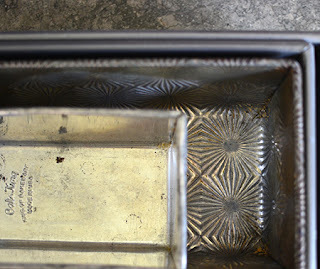 Transfer pan to a wire rack. Let cool in pan for 10 minutes then remove from pan. Let cool to room temperature. 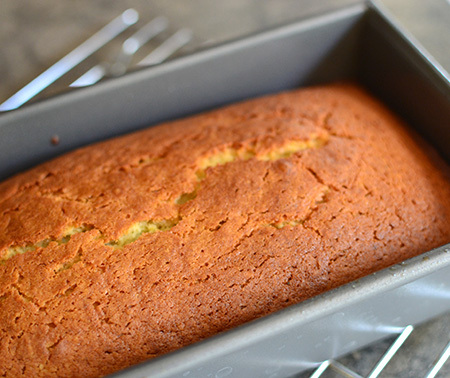 Cake keeps wrapped at room temperature for three days or in the freezer. Wow David, I love cakes like this. I have never baked with lavender. I have some sea salt that has lavender in it and I used it on savory dishes. I can imagine having a piece of your cake with a cappuccino. I bake with lavender all the time. It adds such wonderful flavor, Gerlinde! This sounds wonderful, lavendar and citrus are so nice together. I love your photos, especially the imprint on the bottom of your cake. It's like we're helpig you bake, and we get out of doing the dishes! I almost skipped that photo of the bottom of the cake, but i have never had a cake come out so cleanly before - I just had to put it in! Me, too, Nicole! I used to have tons of lavender in Maine and upstate New York... here the varieties aren't good for cooking. Thanks for the recipe! I love your compromise with combining fruit and cake. I'd go a naughty step further and dollop some clotted cream on top. You need to get to a few of Croatia's islands as they're a bit lavender mad over there. Lavender juice with champagne, lavender cake, lavender cappuccino, lavender lemonade! Maybe I should live in Croatia, John - I already make lavender champagne, lavender cake, lavender cookies, and lavender lemonade! I'm actually someone who's perfectly happy with the fruit without the cake, but I surely wouldn't turn this away! ;-) especially with that nice hint of lavender. 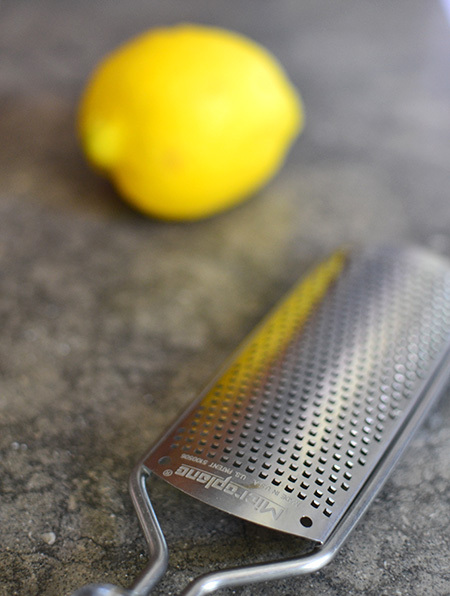 I've never cooked with it, I have to admit, but I love the scent. Somehow, I know that about you Frank... for me, every meal needs closure and somehow fruit just whets my appetite for more food! Or, you could check our Nicole's version and use your lavender fresh from the garden, Greg! I couldn't agree more -- fresh fruit is perfect when accompanied by a slice of cake. I have dried lavender in the pantry and I will try it gluten-free for my son. Yum! Nicole's version is GF - you should check it out! What a beautiful cake, so simple. I love lavender in baking so this is right up my street! Me, too, Caroline. In fact, this recipe has inspired a few others in the interim! This cake sounds absolutely divine, I would love a slice! 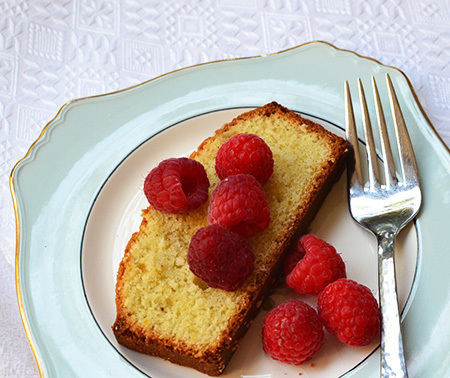 Fresh fruit is always better with cake, especially a homemade one as good as yours sounds. Thanks, Karen - I agree about cake complementing fruit! Absolutely love lavender and this echoes summer and warmth so much, David. Love that stamp with the Bonjour on it for your cake, too! Gorgeous photos as always. Toujours a pleasure to pop in and see what your baking. Gorgeous! 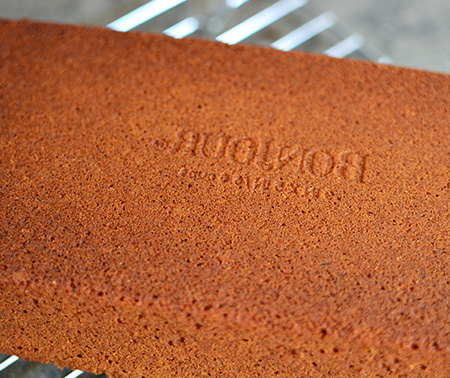 Isn't the Bonjour pan sweet? And I have to say, Jill, I think that a lavender macaron would be lovely, don't you? I love lavender! What a great recipe! David, what a lovely loaf - I like the information baked into the bottom of it! This is just what I need today with a nice cup of tea. Must pick up some fine cornmeal while I'm out. Isn't it funny, Jean? I love when the names of the cake pan come through onto the cake. Like a brand! Beautiful, David! 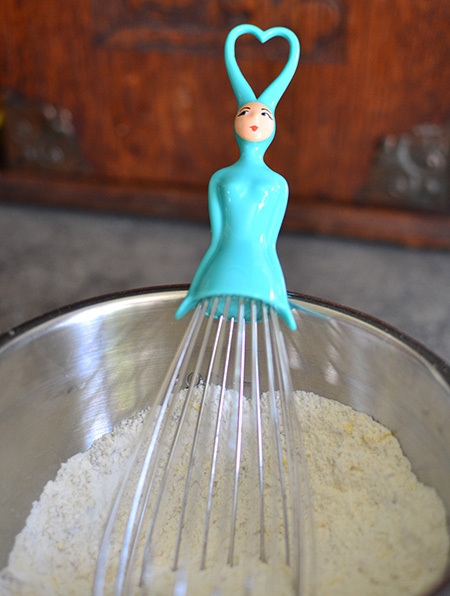 I love that whisk, btw. I've never yet made a cake like this. The closest is my Friuli apple cornmeal cake from a Jiffy mix recipe David Rosengarten shared many years ago! Of course, I adapted it NOT to use the Jiffy mix, haha! I cannot imagine you ever using a cake mix, Christina. Me, neither! hat is so true, Cheri - the best of everything makes for a better cake! Can't go wrong with lemon and lavender, David!